we are leading suppliers & exporters of Daclatasvir Hydrochloridein China, Russia, Hongkong, Bulgaria, Romania, India. Buy Online MyDacla 60Mg Tablets Price India-Russia-China, MyDacla is manufactured by Mylan Pharmaceuticals. Modern Times Helpline Pharma are the leading suppliers, exporters, dealers of MyDacla 60Mg Tablets at very cheapest and reasonable price in Delhi-India. MyDacla is a prescription drug and should be used under proper medical guidance and advice.The information provided here is for general educational purposes only and does not constitute medical or pharmaceutical advice which should be sought from qualified medical and pharmaceutical advisers. 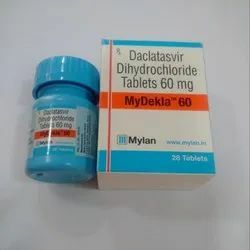 mydacla 60 price in india, mydacla 60 mg price in pakistan, mydacla 30 mg, mydacla 60 mg Suppliers India, mydacla 60 mg Dealers Russia, mydacla 60 mg Exporters China, Buy Online Mydacla 60mg Price India, Buy Online Mydacla 60mg Price Russia, Buy Online Mydacla 60mg Price China, Suppliers MyDacla 60mg India, Suppliers MyDacla 60mg Russia, Suppliers MyDacla 60mg Delhi. Description - The Brand name of this medicine is Hepcfix . Hepcfix medicine contains generic Daclatasvir . Daclatasvir are available in form of Tablets. Each Coated Tablet contains 60 Mg Daclatasvir. One Pack of Hepcfix contain 28 Tablets. The colour of the Hepcfix Tablet is Ferric Oxide USP-NF Yellow & Titanium Dioxide. Manufacturer company name of Hepcfix is Hetero Labs Ltd and Marketed company name of Hepcfix is Dr. Reddy's Labs Ltd, India. 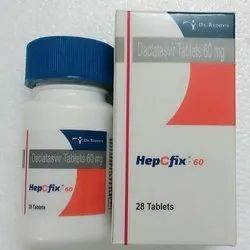 USED - Hepcfix is used to treat hepatitis C, a viral infection of the liver. Warning: Hepcfix medicine out of the reach and sight of children and away from pets, never share your medicines with others, and use this medication only for the indication prescribed. The information contained herein is not intended to cover all possible uses, directions, precautions, warnings, drug interactions, allergic reactions, or adverse effects. Description - The Brand name of this medicine is Daclafab . Daclafab medicine contains generic Daclatasvir . Daclatasvir are available in form of Tablets. Each Coated Tablet contains 60 Mg Daclatasvir. One Pack of Daclafab contain 28 Tablets. The colour of the Daclafab Tablet is Sunset Yellow FCF & Titanium Dioxide. Manufacturer company name of Daclafab is Natco Pharma Ltd and Marketed company name of Daclafab is Sun Pharma Ltd, India. USED - Daclafab is used to treat hepatitis C virus, a viral infection of the liver. Warning: Daclafab medicine out of the reach and sight of children and away from pets, never share your medicines with others, and use this medication only for the indication prescribed. The information contained herein is not intended to cover all possible uses, directions, precautions, warnings, drug interactions, allergic reactions, or adverse effects. Description - The Brand name of this medicine is Daclahep. Daclahep medicine contains generic Daclatasvir . 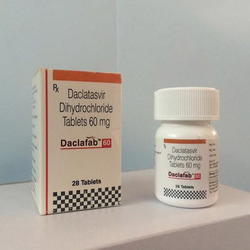 Daclatasvir available in form of Tablets. Each coated tablet contains 60 Mg Daclatasvir. One Pack of Daclahep contains 28 Tablets. Manufacturer company name of Daclahep is Hetero Labs Ltd and Marketed company name of Hetero Pharma Ltd, India. 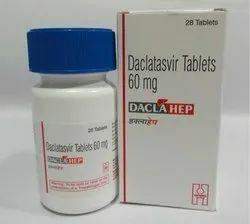 USED - Daclahep 60mg Tablet is used in combination with other medications such as sofosbuvir, interferon and ribavirin for the treatment of hepatitis C infection. Warning: Daclahep medicine out of the reach and sight of children and away from pets, never share your medicines with others, and use this medication only for the indication prescribed. The information contained herein is not intended to cover all possible uses, directions, precautions, warnings, drug interactions, allergic reactions, or adverse effects. Packaging Details: Pack of 28 Tablets. Manufactured By Abbott India Ltd. Description - The Brand name of this medicine is Dalsiclear . Dalsiclear medicine contains generic Daclatasvir . Daclatasvir are available in form of Tablets. Each Coated Tablet contains 60 Mg Daclatasvir. One Pack of Dalsiclear contain 28 Tablets. Manufacturer & Marketed company name of Dalsiclear is Abbott India Ltd, India. 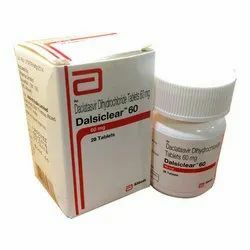 USED - Dalsiclear is used to treat hepatitis C virus, a viral infection of the liver. Warning: Dalsiclear medicine out of the reach and sight of children and away from pets, never share your medicines with others, and use this medication only for the indication prescribed. The information contained herein is not intended to cover all possible uses, directions, precautions, warnings, drug interactions, allergic reactions, or adverse effects. Description - The Brand name of this medicine is Daclitof . 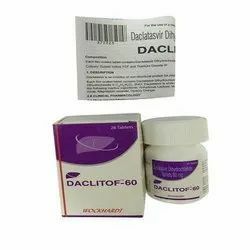 Daclitof medicine contains generic Daclatasvir . Daclatasvir are available in form of Tablets. Each Coated Tablet contains 60 Mg Daclatasvir. One Pack of Daclitof contain 28 Tablets. Manufacturer & Marketed company name of Daclitof is Wockhardt Ltd, India. USED - Daclitof is used to treat hepatitis C virus, a viral infection of the liver. Warning: Daclitof medicine out of the reach and sight of children and away from pets, never share your medicines with others, and use this medication only for the indication prescribed. The information contained herein is not intended to cover all possible uses, directions, precautions, warnings, drug interactions, allergic reactions, or adverse effects. Description - The Brand name of this medicine is Daclacure . Daclacure medicine contains generic Daclatasvir . Daclatasvir are available in form of Tablets. Each Coated Tablet contains 60 Mg Daclatasvir. One Pack of Daclacure contain 28 Tablets. Manufacturer & Marketed company name of Daclacure is Emcure Pharma Ltd, India. USED - Daclacure is used to treat hepatitis C virus, a viral infection of the liver. Warning: Daclacure medicine out of the reach and sight of children and away from pets, never share your medicines with others, and use this medication only for the indication prescribed. The information contained herein is not intended to cover all possible uses, directions, precautions, warnings, drug interactions, allergic reactions, or adverse effects. Description - The Brand name of this medicine is Decihep . Decihep medicine contains generic Daclatasvir . Daclatasvir are available in form of Tablets. Each Coated Tablet contains 60 Mg Daclatasvir. One Pack of Decihep contain 28 Tablets. Manufacturer & Marketed company name of Decihep is Zydus Heptiza, India. 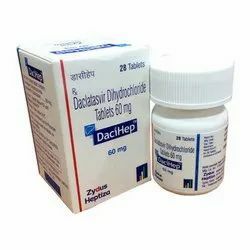 USED - Decihep is used to treat hepatitis C virus, a viral infection of the liver. Warning: Decihep medicine out of the reach and sight of children and away from pets, never share your medicines with others, and use this medication only for the indication prescribed. The information contained herein is not intended to cover all possible uses, directions, precautions, warnings, drug interactions, allergic reactions, or adverse effects. Description - The Brand name of this medicine is Hepcdac . Hepcdac medicine contains generic Daclatasvir . Daclatasvir are available in form of Tablets. Each Coated Tablet contains 60 Mg Daclatasvir. The colour of the Hepcdac Tablet is Ferric Oxide USP-NF Yellow & Titanium Dioxide. One Pack of Hepcdac contain 28 Tablets. Manufacturer & Marketed company name of Hepcdac is Cipla Pharma Ltd, India. USED - Hepcdac is used to treat hepatitis C virus, a viral infection of the liver. Warning: Hepcdac medicine out of the reach and sight of children and away from pets, never share your medicines with others, and use this medication only for the indication prescribed. The information contained herein is not intended to cover all possible uses, directions, precautions, warnings, drug interactions, allergic reactions, or adverse effects. Description - The Brand name of this medicine is Natdac . Natdac medicine contains generic Daclatasvir . 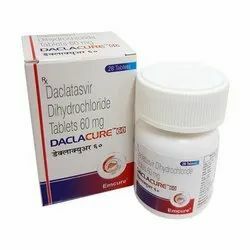 Daclatasvir are available in form of Tablets. Each Coated Tablet contains 60Mg Daclatasvir. 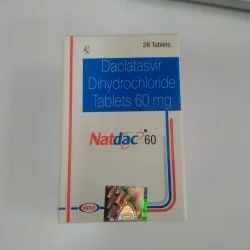 One Pack of Natdac 28 Tablets. Manufacturer & Marketed company name of Natdac is Natco Pharma Ltd, India. USED - Natdac Tablet is an antiviral medicine used in the treatment of chronic hepatitis C infection. Warning: Natdac medicine out of the reach and sight of children and away from pets, never share your medicines with others, and use this medication only for the indication prescribed. The information contained herein is not intended to cover all possible uses, directions, precautions, warnings, drug interactions, allergic reactions, or adverse effects. Description - The Brand name of this medicine is Mydekla . Mydekla medicine contains generic Daclatasvir Dihydrochloride . 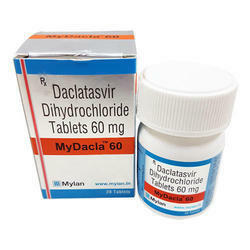 Daclatasvir Dihydrochloride are available in form of Tablets. Each Coated Tablet contains 60Mg Daclatasvir Dihydrochloride. One Pack of Mydekla 28 Tablets. Manufacturer & Marketed company name of Mydekla is Mylan Pharma Ltd, India. USED - MyDekla Tablet is an antiviral medication used for the treatment of chronic hepatitis C in adults. It is normally used in a combination with sofosbuvir, with or without ribavirin. Warning: Mydekla medicine out of the reach and sight of children and away from pets, never share your medicines with others, and use this medication only for the indication prescribed. The information contained herein is not intended to cover all possible uses, directions, precautions, warnings, drug interactions, allergic reactions, or adverse effects.